It's a common topic of discussion at any gun club meeting or any other gathering of shooters: the dwindling number of shooters and hunters getting involved in the shooting sports. Someone will point out the prevalence of gray hair on the firing line and decry the lack of young people getting involved in the shooting sports. Hands-on practice helps develop confidence and begin building safe habits. The use of a dummy gun allows safe demonstrations of common mistakes. Stance, sight picture and technique can be practiced more safely before the added stress of real guns and ammo is added in. To a degree this is a misperception. There are many thousands of young people being introduced to the fun and challenging world of shooting every year through programs of 4-H Shooting Sports, the National Shooting Sports Foundation's Scholastic Clay Target and Scholastic Rifle Programs, Boy Scouts, Junior ROTC, various NRA programs and many other organized youth shooting activities. Simply knowing about these programs and being able to tell interested kids or their parents where to find out about them can go a long way toward bringing new youngsters into the sports. See the accompanying list of the larger programs and their websites, but be sure to ask about youth programs at your local gun club or range--and if they don't have any, consider starting something yourself. Even with the great work these organizations are doing, there is no doubt that there has been a steady decline in gun ownership over the past several decades. It turns out that the vast majority of the kids getting involved in the available programs are rural kids from shooting families, youngsters who were likely to receive other exposure to shooting. The fact is, without some family connection, taking the first steps in getting involved in shooting can be very intimidating. Many of the same shooters who are decrying the lack of new blood in our sports go out of their way to make new shooters feel unwelcome and inadequate. They complain about newer shooters not knowing or following various rules or traditions, but they don't step up to help educate these newcomers in a friendly, non-threatening manner. Shooters and hunters at least expose their friends and family to their sport. That exposure doesn't always leave a good impression, though, and even if it does, not everyone exposed to the shooting sports will be attracted to them. If today's shooters want to guarantee the future health of the shooting sports, it's not enough to just teach our own kids and grandkids we must also reach out to those whose only exposure to guns comes from movies, television and video games. Youngsters are not the only ones interested in getting started shooting. 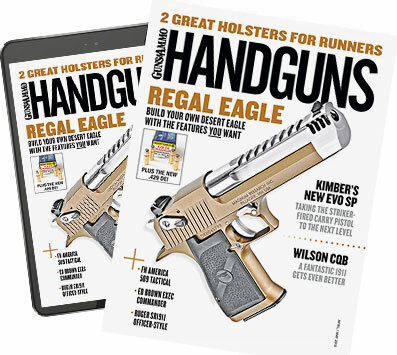 Most of the readers of this magazine know someone--a coworker, relative or friend--who is interested in learning more about guns. This might be a young man whose family was anti-gun, a middle-aged guy who's lived most of his life in places where gun ownership is particularly difficult or a woman who is feeling vulnerable and is considering getting a gun for protection. The starting point is the same: a friendly invitation. New and prospective shooters are usually keenly aware of the fact that there are special rules and expectations for anyone participating in shooting sports, and when a person knows that they don't know something, it is hard for them to be very confident about barging in. Having a friendly, low-stress introduction to firearms and basic firearms safety can make a huge difference in a person's attitude toward shooting and shooters. Some shooters--even experienced, knowledgeable ones--are uncomfortable in the roll of mentor or instructor. They sometimes feel they are not qualified or think they have to prepare a comprehensive curriculum in order to start someone off on the right track. Others don't worry about such things at all and simply grab a few guns, a bunch of ammo and their new shooting buddy and head for the firing line. Both of these approaches have problems. Obviously, never getting around to actually taking anyone to the range doesn't do much to bolster the ranks of the shooting fraternity. On the other hand, just throwing someone onto the firing line has drawbacks, too. New shooters can be intimidated, be overwhelmed, feel unsafe and develop bad habits if they are immersed in things too quickly without at least basic preparation. Luckily, the solution for both of these extremes is very easy to implement. An elaborate training program is not at all necessary, but some classroom instruction and dry practice are mandatory to make the experience safer, more comfortable and much more pleasant. Exactly when and how such classroom time occurs depends on the needs of the student and the comfort level of the instructor. Generally speaking, anyone thinking of inviting a new shooter to the range should review basic safety materials and take some time planning the outing and choosing guns, ammo and targets that will be particularly suitable. Each situation is different because each student is different. It is up to the mentor/instructor to fit the course to the student. A dozen Boy Scouts have different needs from a buddy from work or your wife or girlfriend. Generally speaking, women and men approach guns with different attitudes that pose different challenges. Not surprisingly (especially to the women), men tend to approach guns in a similar fashion: a bit too cavalier, with a confident grip and little attention to placement of their trigger finger or what's covered by the muzzle. Women tend to have some trepidation about handling guns. They are very attentive to keeping their finger off of the trigger and the muzzle pointed if not in a safe direction, at least away from themselves. Different organizations have different sets of rules and different ways of remembering them, but they all boil down to the same basics. Truth be told, every six-year-old has a rudimentary grasp of the three most important questions: Where does the bullet come out? What do you do to make it go "bang?" What happens to what the gun is pointing at when it goes "bang?" Anyone who can answer those three questions and grasp the true gravity of the answer to the last question knows all they really need to know about firearms safety. Everything else is just tricks and techniques to help transform safe practices into habits. ssible with three core "Always Rules" and two sets of five rules each for the range and the field. The Always Rules can be remembered as "Always say Never, Never." They are: 1. Always treat every gun as if it's loaded (even when you're sure it isn't). 2. Never allow a gun to point at anything you would not want destroyed. 3. Never allow your finger to enter the triggerguard until you are ready to shoot. Along with the Always Rules, everyone should know these Range Rules: 1. Always remember the Always Rules. 2. Always wear eye and hearing protection. 3. Keep guns unloaded with action open or holstered, except on the firing line. 4. Guns should always be pointed toward the target and away from people. 5. Guns should never be handled when people are downrange. All guns should be empty and holstered, racked or benched whenever there is anyone downrange. The bolt-action .22 rifle has long been the favorite for beginners, with good reason. It is easy to use and, more important, easy to use safely. Anyone planning to hunt needs to know these Field Rules. 1. Always remember the Always Rules. 2. Keep the gun unloaded until you're on the ground and ready to hunt. Many accidents happen while transferring guns to and from a vehicle. 3. Clear the action any time you cross a fence or climb a tree. 4. Always know where everyone else in the field with you is at all times. 5. Be certain of your target and what is beyond it before firing. Regardless of the specific rules or system you choose to teach, keep it simple and clear. Once your students understand the rules, give them an opportunity to get their hands familiar with what their heads have absorbed. Handling practice and drills (using dummy guns when working with more than one student at a time) help students begin to develop muscle memory and safely see how easily mistakes can be made. Practicing what they will actually be doing on the firing line--loading, clearing, clearing jams and moving while holding the gun--reveals expectations and helps to relieve insecurities. Now is also the time to review practical matters such as sight picture and shooting stance rather than trying to introduce these matters in the midst of the pressure and excitement of using real guns and live ammo on the firing line. Keep in mind that you don't want to instill bad habits such as flinching or jerking the trigger, so ease of handling and light recoil are distinct advantages for the true beginner. The lack of recoil and muzzle blast make a .22 a good choice for an introductory gun. And even when the end objective is to gain competency with a handgun (or shotgun), starting with a .22 rifle often makes sense. It is much easier to teach the fundamentals safely on a lightweight rifle. When you move your student up to more powerful guns, lighter target loads make better choices than full-house loads. Once you've introduced someone to the basics of firearms safety and gotten him hooked on the sheer fun of shooting, provide him with some resources to help him pursue the shooting sports on his own. The National Shooting Sports Foundation is particularly helpful (see accompanying sidebar). There are thousands of people who would like to know more about firearms, firearms safety and shooting but don't know whom to ask. If you're willing to share your love of the shooting sports with others, you should find an endless supply of interested students. So stock up on ear plugs, get a couple of extra pairs of shooting glasses, and start shooting for the future.